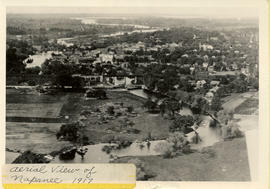 Aerial photograph of Napanee, Ontario, looking towards the southwest. Fonds consists of the following series: Breden-Ham-Sharp family photographs, Publications and Clippings from the Breden, Ham, and Sharp family members. Fonds consists of the following series: Robert Phillips correspondence; Robert Phillips Photographs and Robert Phillips Research. Fonds consists of the following series: World War 2 Military training materials. These items Ron used as an instructor during World War 2.